After discussing my observations on our sujuk sausages with the expert (my Mum), it turns out she'd noticed the same thing on her sujuks and has taken two steps to ensure final success - she's dusted them with a mixture of flour and paprika and she's put them in the freezer which is frost free. So tonight, I measured up about a tablespoon of paprika and a tablespoon of plain flour and mixed them well in a deep bowl. Then I set about dusting. The powder did stick to the sausages very well and far too thick too, so I had to brush off all the excess with my egg brush. I still don't feel too comfortable about placing in the freezer - they have to be put in there "naked" so to speak, not in a plastic bag or similar. I might give it a try on a couple of them over the next few days, I need to work out a way of not getting the freezer dirty with grease and flour and paprika. Here they are almost done and dusted. The drier parts at the edges didn't pick up too much of the dusting, as you can see. But they are now closer to the ones in the shop, on the surface at least. Industrially made sujuk of course contains a lot more fat. Click here for the next step in this adventure. 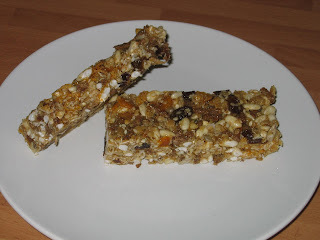 A couple of days ago Lundulph challenged me to make him a müsli bar based on my own recipe. This in order to skip breakfast at home and beat the traffic on his way to work. A quick google resulted in the following, extremely tasty creation, that's also probably quite unhealthy. Melt the butter on low heat in a fairly large sauce pan. Add the sugar and honey and stir until they are dissolved. Leave to simmer for 7 minutes. Do not stir or shake. In the mean time, line a deep pan with baking paper. 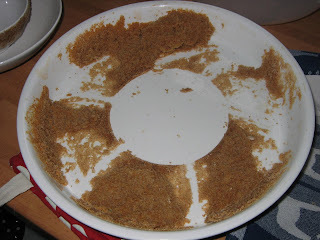 Pour in the müsli mix and stir in well to get everything coated in the sugar/butter mixture. Cover with another piece of baking paper, then place as much weights on top as possible and leave to cool. I have two identical deep pans, so I poured the sticky mixture in one and placed the second one on top. I put my big pressure cooker pot inside and filled it with water, along with the second pan. I left it to cool overnight. This morning I cut the müsli slap with a knife. It was not as sticky as it looked and still fairly soft, so no risk of breaking any teeth. Lundulph said he liked it too, but was worried about the health factor. So the challenge is not complete yet. 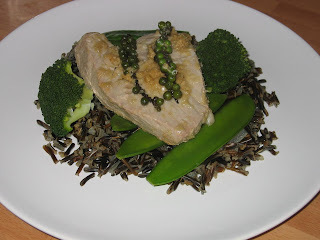 Inspired by Fred and Ginger, I'd planned to steam fish this week and since they were so sweet and gave me a packet of lovely green peppercorns the other day, I got some tuna steaks, broccoli, mange tout and a selection of fresh herbs - dill, mint, basil and lemongrass. I was particularly excited about the lemongrass as I've never used that before, it always looks so dry in the shop and I've never felt tempted to buy it. I've missed a lot there, I realise that now. The ginger paste is just plain ginger that has been run in a food processor into a pulp. A couple of times a year, I buy about a kilo of fresh ginger, spend a couple of hours in front of the TV peeling it all, then process until fairly smooth, distribute into ice trays and freeze. Press the garlic and mix with the ginger, oyster and soy sauces. Place the tuna steaks on a large plate and distribute the mixture over them and rub it in on all sides. Leave for a few minutes. Wash all herbs, cut the lemongrass lengthways in two, wash the mangetout and the broccoli and cut into florets. As I don't have a bamboo steamer, I had to make do with my metal one and as it's smallish, I used the one for my pressure cooker as well. And because they are both metal, I placed two layers of cheese cloth at the bottom, so the fish wouldn't stick. Place the fish at the bottom of the steamer, then all the herbs on top, then mangetout and broccoli on top. Steam for 5-6 minutes. I left to steam a bit too long and the fish was slightly overdone. I also forgot to take off the lid of my pressure cooker after turning off the heat and sadly tomorrow's dinner will be even more overdone and the veg will be the dreaded yellowy hue. I served with Canadian wild rice, which I'd prepared before, as it takes 45 minutes. Needless to say, this was one yummy and quick dinner. Definitely a repeat. Also since we'd been so very very healthy with this, we had scones with clotted cream and strawberry jam for dessert. Happy thoughts! As I'd not cooked for a week, I thought I'd start off with something I've wanted to do for a while - a Swedish dinkelbröd (link is in Swedish). It's made of spelt wheat, which apparently is what was used for flour in Medieval Europe. From reading up on this, spelt wheat farming stopped in the early 20th century, but is now making a good comeback and is really trendy these days. 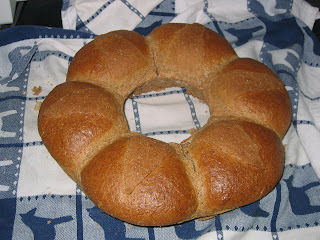 Also, I did some browsing of foodie blogs and spotted this on Wild Yeast - a Couronne Bordelaise - and I was speechless! I've never imagined that such beautiful breads existed. 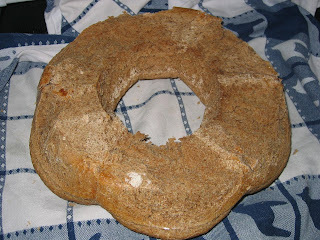 So two birds with one stone, today I mixed up the bread and made a couronne of a sorts. And I used regular yeast this time, none of the fast acting stuff. Activate the yeast in the water. Mix all ingredients to a sticky dough. Leave to rise overnight in the fridge or for an hour in room temperature. Knead into the desired shape and leave to proof for another 30 minutes or so. Bake in a pre-heated oven at 175 degrees C / gas mark 4. My couronne took 50 minutes. I made the mistake of putting in 2 tablespoons of olive oil, so the dough was possibly extra sticky. Also my dough was almost twice the size as what was recommended in the couronne instructions. And one of the instructional photos seemed so pretty with the bread shaped like a star, I wanted to keep that on top, rather than bake it like a true couronne. And here are the several mistakes or so I made. I didn't grease up the ovenproof dish before putting the dough in. I forgot to take out the little bowl in the middle and it wasn't really ovenproof. The bread baked very nicely and after 50 minutes, I took it out and covered it with a tea towel. I always remember my Mum saying that you can't eat bread straight out of the oven, it has to rest for a few minutes "to run around it's field" she used to say. I e the field where the wheat grew, the wheat that was used for the flour. I haven't seen it mentioned elsewhere, so I'm not sure if that's really a thing to do or not, but it certainly makes the crust a bit softer. I brushed the bread with an egg in the hopes to make the star shape become more obvious, but sadly egg on dark breads never really works, does it? Still, the bread was quite tasty - a bit on the heavy side and rather crumbly as Lundulph discovered when he was buttering his slice. It was rather nice, but I'd need to have a regular wholemeal bread side by side for a taste comparison, I can't tell the difference on it's own. Rather interesting and I'm glad I tried it out. And I'll definitely need to repeat the couronne, I must get it right, it looked so pretty. Lundulph and I got back from a week in windy Cornwall yesterday. It was nice, but extremely windy. And I picked up a book on how to make clotted cream and I'll be trying it out next week-end. Very exciting. 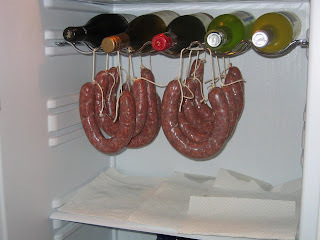 In the mean time, our sausages have been happily hanging in the fridge. But of course, since it hadn't been opened for about a week and so there had been no reason for it to extract any moisture, so the sausages are still quite soft and also had some small nodules all over them. I was a bit worried, but they seemed to be little blobs of fat. I wiped all sausages and rolled them. They are getting nice and flat, I hope that they'll be ready by the end of next week, both Lundulph and I are drooling in anticipation. Actually I need to explain further on the rolling of the sujuks and the pricking of the skins. Both are compulsory in fact. The skins are to be pricked, so they don't burst when the sausage is rolled. And the rolling is done in order to help the sausage dry as evenly as possible. Obviously the meat nearest the skin will be the first to dry and by rolling, the meat is slightly displaced, and so things dry more evenly. Either way, we're now counting the days until the sujuks are ready. Last night it was time for the first rolling and Lundulph kindly complied. He did a really good job of it too. 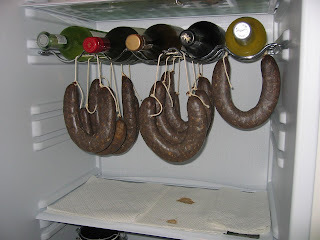 The sausages have definitely begun to dry and have gone darker, closer to their final colour. Also I seem to have filled them fairly well too, as no air bubbles had appeared. If they do, they need to be pricked with a needle. All we need to do now is to wait the 25 days and roll every now and then. Click here for the next part of this adventure. Last night I made the sujuks. Very exciting and it got a bit late, so I didn't get to blog about it. The whole went faster than I thought it would and it was rather fun too. 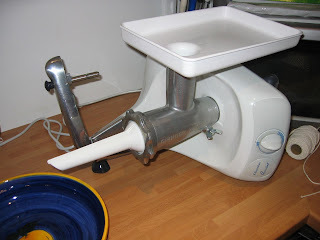 Here is my sausage stuffing machine, it's my beloved Electrolux Assistent with a new attachment. I'm not sure I needed to soak the intestines. I think that's only needed when they have been stored in brine or salt and that in order to make them more flexible. The sujuk tends to be on the salty side once it's done, after all water and other liquid has evaporated, so getting some of the salt out of the skins is a good thing. Anyway, the intestine is threaded onto the plastic pipe. 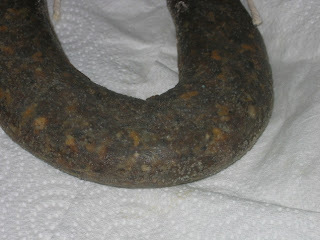 I actually had more intestine that would fit onto the pipe, so I had to cut it off. Before I tied the end, I filled the machine up with mince mixture as far as possible to avoid air bubbles. Once the mince started showing at the end of the plastic pipe, I pulled out a little bit of the intestine and tied a string around the end. Then I switched the machine on and started stuffing it with more mince. 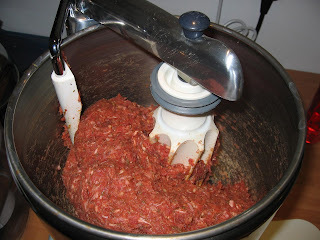 At approximately 30 cm lenth, I stopped the machine and squeezed the mince away from around the pipe and tied the string around for the second end of the sausage. With a new piece of string I tied the beginning of the next one. After just under an hour, I had eight and a half sausages. The last one was a bit tricky as I ran out of mince and there is just so much I could push down the machine with the plastic stick. So for the last half, I took off the plastic pipe, took out as much of the mince that I could and stuffed it manually. This was quite tedious and I'm not doing that again. Almost immediately the sujuks started dripping, so we've lined with kitchen tissues and we swapped them tonight. There will be more of this over the next couple of days. Hopefully the fridge will be sufficient to get them dried. They do have a strong smell though. It's not unpleasant, but too much of anything is not good, so I'll have to get hold of something to neutralise it with next time. My mixture of mince was 75% extra lean beef and 25% lamb. Basically what I happened to have in the freezer. Generally pork is mostly recommended, but it's not that important. Also if you can't get hold of any kind of sausage skins, or just feel it's too disgusting, cheese cloth can be used as well instead. Just form the mince into a long sausage and roll it up into a piece of cheese cloth, so that it covers it with a couple of layers. Once we'd put the sujuks in the fridge, some of them kept sliding out of the string knots. I'm not sure how to tie them to prevent this. Must remember to leave more bits of the intestine at each end next time. Yesterday I had to re-tie them a couple of times. They are staying put now though. Finally when I cleaned out the sausage machine, I ended up with a handful more mince. This I flattened into a hamburger shape tonight and fried for Lundulph's dinner. He thought it was excellent and suggested we make this mixture for our next barbecue. The next big thing to do is on Sunday evening, when I'll take the sujuks out and roll them for the first time. They will shrink as they dry and rolling will push the air out and make the sujuk denser. After yesterday's pancake indulgence, we were good and had salad tonigt. I reduced the recipe to two eggs which resulted in 3 pancakes each. One with sugar and lemon, one with Nutella (yum!) and one with strawberry jam. We also had blackberry jam, fig jam and white cherry jam, but there weren't enough pancakes for that. Not to mention all the jellies screaming for attention in the fridge. But I also started on the following. This is the big one for this year, I think. I'm making cуджук (sujuk). 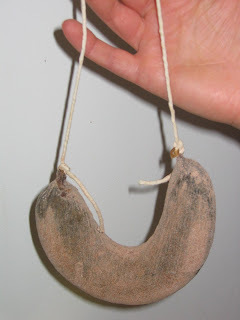 This is a dried sausage, shaped like a horseshoe. Possibly of Turkish origin, but very popular in Bulgaria, along with луканка (lukanka). The main difference to me seems to be in the shape and thickness of these two. And of course every region has their own combination of spices. The one I'm making is based on my parents recipe that they've developed and tuned over the past 25 years. This is the first time I make this, so to be on the safe side, I'm making less than half of the amounts. Of course as for most sausages, you need sausage skins, and because the sujuk needs to be dried, the sausage skins must be porous. Traditionally sheep or pig intestines are used, but there are artificial alternatives as well. Our butcher did have pig intestines and amidst a bit of sniggering, I got some last Saturday. When the sujuk is ready, I'll bring them some. They thought it was rather amusing that I'd try to make sausages at home. Notice that this will take the better part of a month and so will be spread over several posts. Mix all ingredients well and leave overnight so all flavours are released. Next day, place the (natural) sausage skins in water for a few hours. 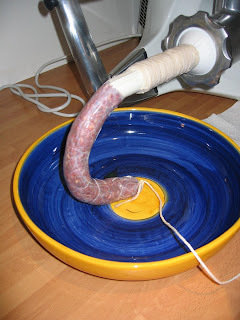 Thread the sausage skin onto the sausage filling machine and tie a piece of string at the end. 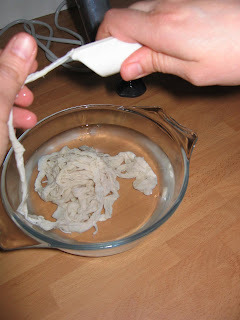 Then fill a length of about 30 cm and tie with the other end of the string, so a loop is formed between string and sausage. Cut off the end and repeat the previous step with the next sujuk. 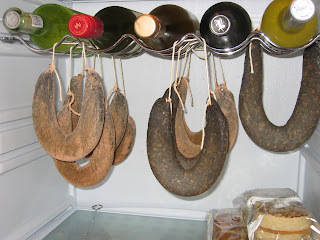 Hang the sujuks in a cool place to dry. After 2 - 3 days, carefully roll each sujuk with a rolling pin and leave to hang and dry again. Repeat the rolling 2 - 3 more times while the sujuks are drying. They should be ready after about 20 - 25 days. If you grow tired of waiting this long, or just fancy trying it, the sujuk can be fried during the drying period. Works pretty much like a regular sausage. When the sujuk is ready, remember to peel off the sausage skin. It's normally eaten as a snack, sliced thinly along with a fine rakia. Maybe salad as well. Commercial sujuk tends to have a higher fat content, so in making your own, you can ensure that it's mostly meat, not to mention the spice combination. Today I made step 1 above - mixed everything and put in the fridge overnight. My fabulous kitchen assistant machine not only mixed all the ingredients in a whizz, but will also help me stuff the mixture into the sausage skins tomorrow. Here's an action shot. On Saturday I decided to finally try out the idea of leaving a dough to rise slowly in the fridge overnight. True, I made the dough in the morning, so overnight in this case would have been some 24 hours plus. I made the dough for the cinnamon buns and again I made a double amount. I divided in in two, leaving one half to rise normally and the other I put in the fridge. Here's where things started going wrong - the dough in the fridge rose at the same speed as the dough outside! I had to punch it down or it would have invaded the whole fridge. After that, it remained smallish. From the half left outside, I made cinnamon buns, a bit on the small side, but still. Baked half of them, the other half I put in plastic bags and in the freezer. The idea being to be able to have them freshly baked on demand, rather than freezing after they're baked as they tend to dry out quickly when reheated in the microwave, not to mention that the nib sugar goes soggy then too. So will post later on how this part of the experiment works. Yesterday, I took out the dough from the fridge - it hadn't moved since I punched it down. I took off the cling film and noticed the dough was wet with condensation. Very sticky when I took it out of the bowl, but also it smelt "funny". I took it to Lundulph and he said it smelt fermented. And of course that's what it was - yeast and sugar and nothing to kill the yeast after the initial rising (being a sweet dough, no salt was added, salt kills the yeast). And I'd no intention of baking that stuff, so ended up binning the lot, very sad. Now my new fancy pastry book specifically says that fresh yeast should be used, but if course I've not been able to find it in the UK. As an alternative there's dry yeast, but under no circumstances should quick yeast be used, the book said, as it contains more than just yeast that makes things rise quicker and removes the control over things. So this is what I'm blaming for my fermented dough at present - I only use quick yeast nowadays, since it's needed for the bread machine. My Mum often makes dough and leaves it to rise overnight and that always works out (I can only remember her having one mishap in the kitchen throughout my entire life). But she uses fresh yeast, something readily available in Sweden. Also she really does mix the dough in the evening and makes it first thing the next morning. So I'll be buying myself some regular dry yeast and make a second attempt. The idea behind this part of the experiment is that I could make the dough on Friday night and then make the buns on Saturday morning, and not have to lose half the Saturday with rising etc. At present though, the freezer is cram-packed with food, so won't be cooking anything major for a while now. But I have a few things up my sleeve (or in the fridge actually) that I'll write about over the next few days. The other day my new cookery book arrived, The Professional Pastry Chef by Bo Friberg. Needless to say, despite it being big and heavy enough to club a seal with, I skimmed through quite a few parts of it and decided to begin with some biscuits, since I haven't made any in ages. I hadn't realised that this is actually written to be used in teaching future pastry chefs, but there's so much that's so very interesting, I think it's good for advanced or eager amateurs too. Blend all ingredients except the cocoa powder, in a food processor with the cutting knife or a dough mixer, which is what I used. Very important that it's done on low speed to avoid warming the ingredients, as this will apparently affect the final texture. Divide the dough in two equal parts and mix the cocoa powder into one half. Knead until the cocoa colour is completely even. Place in the fridge for about an hour to chill the dough. It needs to be firm enough for the next step. Take out the two parts and roll/squeeze into 25-30 cm long "ropes". It's more squeezing than rolling, the dough tends to crumble when rolling. Divide each "rope" into three parts. Now starting with one of the white dough pieces, press it onto the baking surface, place a brown dough piece on top and press in, then a white and so on alternating with all 6 pieces. 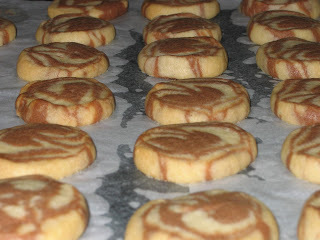 Then roll up the layered dough into a log and again roll/squeeze it to reach a diameter of about 5 cm. At this point it needs to go into the fridge again to get it firm, but it was getting late and despite the strict instructions in the book on not skipping the chilling stages, I did. Preheat the oven at gas mark 5 (190 degrees C). Cut up this log into 5-6 mm thick slices and place onto a baking sheet lined with baking parchment. Bake in the middle of the oven for 15 minutes. The recipe called for 190 degrees, but I think maybe gas mark 5 was a bit too high, possibly do gas mark 4 and bake for 20 minutes, to avoid browhing the biscuits too much. From the quarter of the original amount I produced 47 pieces. They are now cooling in the kitchen. Lundulph and I couldn't wait and tried them out, I even burnt my tongue on mine and the verdict so far is that the texture is rather nice, but they felt a bit more flour-y than sweet, so it may be necessary to increase the amount of sugar next time. But will see when they have cooled completely first. I'm not too happy with the marbling effect and I think I flattened the dough too much during the layering and then had to roll it up. Next time, I'll first stack the pieces and just start rolling the log straight away, maybe twisting slightly to get a bit of interest into it. And as you can see from the photo, they are quite greasy, but the book is explicit on this, not try to make them healthier by substituting the butter and I agree with that. What I found particularly attractive about these biscuits is the fact that once the dough has been rolled into the log, it can be wrapped up in cling film and frozen until needed. How brilliant is that? Fresh biscuits on demand. Update 2nd February: Well, I was right, the biscuits definitely need a bit more sugar, otherwise the texture was wonderfully crumbly. Also should perhaps make them slightly smaller and not skip the second chilling stage, as skipping it made the cuts flat and I had to re-shape each one before baking. Also I think caster or granulated sugar may give a bit more crunch to the texture as well. The test panel, consisting of various relatives concur - more sugar!